Long before Carole King became a chart-topping music legend, she was Carol Klein, a girl from Brooklyn. Beloved for penning such classics as "You've Got a Friend" and "I Feel the Earth Move," she fought her way into the record business as a teenager and ultimately flourished, writing hits for some of the biggest acts in rock 'n' roll. But it wasn't until her personal life began to crack that she finally found her true voice, writing and performing the soundtrack to a generation. Beautiful is the inspiring true story of King's remarkable rise to stardom, from part of a hit songwriting team with her husband Gerry Goffin, to her relationship with fellow writers and best friends Cynthia Weil and Barry Mann, to becoming one of the most successful solo acts in popular music history. It's no surprise that Beautiful - The Carole King Musical won a Grammy for Best Musical Theater Album of 2015. A resounding success on Broadway, this unforgettable show now comes to Washington, D.C.'s National Theatre. "...The show hits the perfect balance of nostalgia - the songs are carefully selected to show King's growth as a woman and artist, and are mostly familiar with a few pleasant surprises that softly tug at the audience's memory. The show plays off of the audience's knowledge, but never feels forced or exploitative; it also thrives off audience reaction, so it's an impressive balance to draw the audience in without pandering. The nostalgia feeling is also appropriately magnified by Alejo Vietti's incredible costumes and clever costume changes, and Derek McLane's set pieces, which manage to be both boldly colorful and minimalistic." 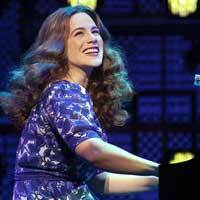 "...Carole King’s story, as portrayed by Bockel and this splendid cast, is Beautiful indeed. This is a delightful tale of a woman’s journey into self-empowerment, with music that will stir joyous memories for those of us of a certain age. Other ages will love it as well, so waste no time in getting tickets." "...Similar to a musical composition, "Beautiful" captures the complicated highs and lows that King experiences, only to build before she finally reaches a breakthrough and receives much deserved critical acclaim." "...You certainly will feel the earth move at the National Theatre right now through the end of the year! Beautiful is just that……BEAUTIFUL. Under the direction Marc Bruni this production leaves you feeling nothing short of wonderful. I guarantee after seeing this show your toes will be tapping and you will be humming Carole King’s extraordinary music for days to come. I had the pleasure of seeing the Beautiful tour open back in 2015 at the Providence Preforming Arts Center in Providence, Rhode Island and I’m here to tell you, three years later it hasn’t lost its magic. In most cases, a musical based on an artist’s life is solely about the music and the book seems to fall short. This is by far not the case, Douglas McGrath has done a wonderful job recreating Carole King’s story in a way that makes you laugh, cry, and share in the journey of who we know now to be, the Carole King." "...Though I wished Douglas McGrath’s script was more substantial, I admire aspects of it. Some of the humor it mines is cheesy, but some of the lines are pretty witty. And the central four characters, if drawn in somewhat broad outlines (particularly as regards the running joke of Mann’s hypochondria), are presented respectfully."